The Honda Pilot is the ideal three-row family-friendly crossover utility vehicle. The current 2016 Honda Pilot was redesigned to include more power and efficiency, more versatility and capability, and more safety and technology. The base LX trim level delivers a long list of important features and comes at an affordable price point to meet the needs of Chicagoland families, from Elgin to Crystal Lake, IL. Find out more about the latest Pilot LX here at Brilliance Honda of Crystal Lake! The 2016 Honda Pilot comes standard with a 280 hp V6 engine in all trim levels. The LX gets a six-speed automatic transmission and front-wheel drive standard. All-wheel drive is available. With front-wheel drive, the six-speed Pilot is rated by the EPA at 19 mpg city/27 mpg highway/22 mpg combined*. The all-wheel drive model is rated at 18 mpg city/26 mpg highway/21 mpg combined with six-speed automatic transmission. The Pilot, when properly equipped, is capable of towing up to 5,000 pounds with all-wheel drive. The 2016 Honda Pilot comes standard with features like traction and stability control, anti-lock brakes, a rearview camera, and front, front side, and side curtain airbags. 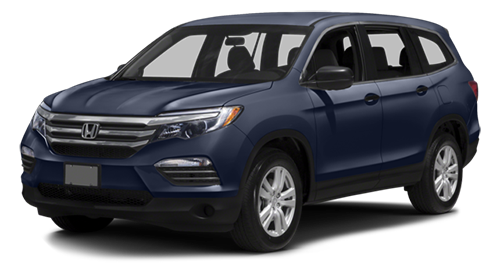 The LX is actually the only trim level in the Pilot lineup that is not eligible for the Honda Sensing system, so if you’re looking for that safety technology, you’ll need to look farther up the lineup. You can find the current 2016 Honda Pilot LX along with the rest of the Pilot lineup, here at Brilliance Honda of Crystal Lake, IL, the leading Crystal Lake, IL area Honda dealership. We’re located at 680 W. Terra Cotta Ave. in Crystal Lake, IL, so come visit us today to find the next crossover utility vehicle to fit the needs of your family! *Based on 2016 EPA mileage estimates. Use for comparison purposes only. Do not compare to models before 2008. Your actual mileage will vary depending on how you drive and maintain your vehicle.